“I’d wonder where I’d go if I could fly around downtown” — I have always been dreaming of this. Now I’ve got a chance to see the earth with my so-called broadband connection. Anyway, you need one thing, Google Earth and it’s now FREE! The idea is simple. Itâ€™s a globe that sits inside your PC. You point and zoom to anyplace on the planet that you want to explore. 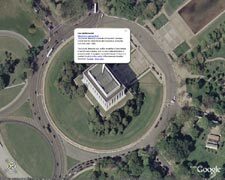 Satellite images and local facts zoom into view. Tap into Google search to show local points of interest and facts. Zoom to a specific address to check out an apartment or hotel. View driving directions and even fly along your route. We invite you to try it now. TechForge.com aims multiple channels for specific technologies, and now it’s starting with Eclipse, which is my favourite Java IDE. Now I have a chance to learn more about that technology at one place.